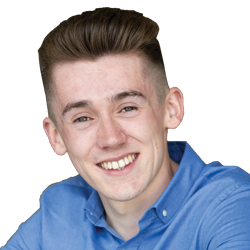 Owen is taking a year out from his studies on the International Travel and Tourism Management course to represent and support the students on the Coleraine campus. During his first two years Owen was a course rep and a committee member for the STEW Society – both of these roles gave him an insight into the SU and led to him running for the full-time role. The role of each Vice President is to represent and support the students on their campus. Owen will work with the University and SU staff to deliver the best student experience possible for students on campus – both in terms of fun social activities, and your academic life!